To me, summer has always been the season of meadows. While in spring the light fills the forest, bringing flowers, ferns, and understory plants to life; by summer, the forest is a cool, dim respite, a darker, more peaceful place to escape the burning heat of the sun. So it is the meadow that seems to properly represent this season of blazing hot days: steaming humid afternoons, rain storms that blast out of the late afternoon and early evening to drench the world and leave things glistening and green. Meadows this time of year are bursting with life. You sit down, lie down, fall back into the grass and above, see only sky, bits of grasses and shrubs just coloring the edges of your vision. Looking up, a few clouds float past, perhaps a hawk or a vulture circles high above, the horizon expanded by the lack of trees. In the meadow, the world is all waist-high. Though in the forest we are dwarfed by the size of even small trees, here everything is closer and we are put into a natural context by this proximity. We are a part of this meadow, as I am reminded when thorny blackberries grab at my clothing and I pull a caterpillar from my skirt. 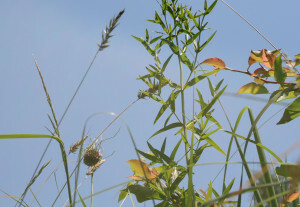 Milkweed stalks bend and bounce slightly in the soft breeze, knee-high butterflyweed shines fluorescent orange in the field of green; vetch climbs up and down the grasses, sprinkling the meadow with purple. I search for butterflies, finding a few here or there, as well as countless beetles and bees. I lean into the smell, the heady, rich perfume of milkweed mixing with the warm smell of dry grasses. 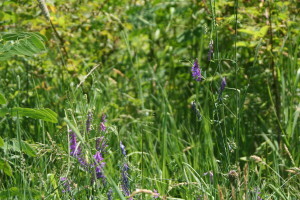 Meadows offer a unique space for diversity to flourish, offering full sun, cooler microclimates below the grasses, and space for small mammals like field mice and voles and myriad insects to find their food and shelter. I watch a dragonfly, large, dark against the dense green of the field, circle, landing first on a branch of invasive bittersweet, then moving to a young sassafras. Everywhere, the edges of the meadow are tinged with the shifting ecology of this place. Sassafras, cottonwood, and other sun-loving trees are beginning to move in. 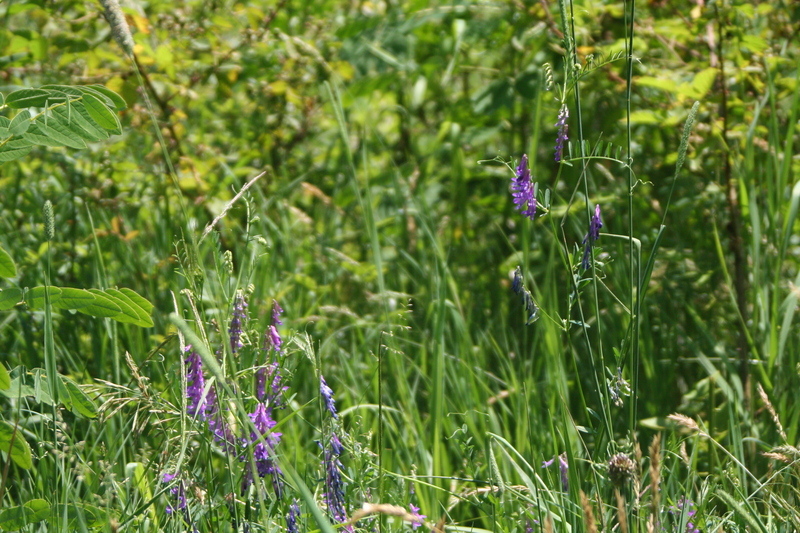 If meadows offer a place for biodiversity, they are also a battleground of invasive plants. Though the glowing green vista of a meadow, whether small or large, can seem invincible, it is not. Here, where the sun is plentiful, plants with an evolutionary advantage from regions far afield, can rapidly take over: bittersweet, mile-a-minute, thistle. Still, this is where to be in the summer: it’s a place to settle down into the spot where you are. This year has brought us an uncommonly cold winter and a late spring and a summer so blissfully slow that when the 90-degree days hit, it somehow came as a surprise. Some are beginning to wonder if the seasonal patterns that we have always counted on to mark the passage of time in temperate climates may be vanishing. We see storms on the rise, the shifting of temperature and the diminishing of thousands of species. There is no question that our world is in flux. And so, I offer this as comfort: go outside, allow yourself to celebrate the thing that is, to be in the place where you are, and to appreciate the beautiful biodiversity of this meadow season. This entry was posted in Land Stewardship, Nature. Bookmark the permalink.